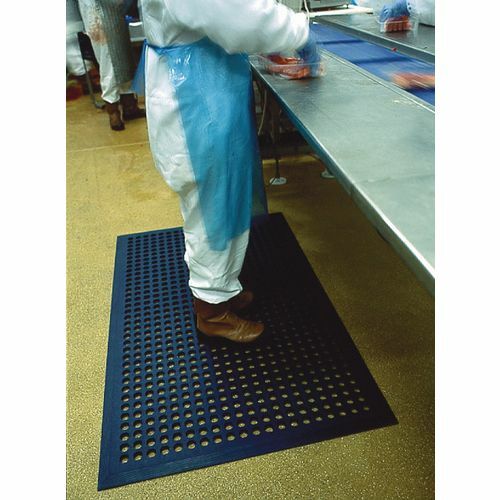 Rubber worksafe mats - Black, general purpose. Slip resistant, anti-fatigue, anti-wear mat. Manufactured from extremely hard wearing rubber with moulded bevelled edges. 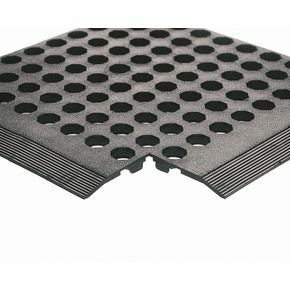 Unique underside design prevents mat slipping. Allows swarf, oil, grease and debris to fall through. Size: 900 x 1500 mm. Ensuring that your employees are safe and comfortable whilst working creates a more productive workplace, so it is important to maintain this especially if they work standing on their feet all day. Our rubber worksafe mats can help you achieve this as they are slip resistant, anti-fatigue and anti-wear mats. There are two different types available for different applications; general purpose which makes them ideal for most workplaces or grease proof which would be best used in companies which come in contact with slippery substances such as oil. Both types of matting allow swarf, oil, grease and debris to fall through and the unique underside design prevents the mat from slipping. They are manufactured from extremely hard wearing rubber with moulded bevelled edges to prevent them from being a trip hazard. Our rubber worksafe mats will help make your workplace safer for employees and help reduce fatigue in your workforce; they are available in packs of one or three and come with a 12 month guarantee and FREE UK Delivery.